Though certainly not as numerous as vodka cocktails, there are thousands of great gin cocktails to explore and the list can be quite overwhelming. Some cocktails work best with a specific gin, some are for acquired tastes and others are reliable and always there for us when we need them. If you're just starting out on your journey through the world of gin cocktails,​ we recommend the ones listed below as essential to your experience. All are quite popular, some more than others, and each has a different appeal that has drawn in drinkers year after year for decades. The selections include gin at its best in the simplest of mixes as well as in the more complicated, often disputed, and finely balanced recipes. These classics are some of the most timeless drinks that you will find. We will begin with the most obvious of gin cocktails, the classic Gin Martini. You can call any other beverage in a cocktail glass a "martini," but there is only one real Martini and it requires gin. The beauty of the Martini is in its simplicity: gin and dry vermouth mixed in your preferred proportions, best stirred, though shaking is not out of line. It is the cocktail that is the base for countless other drinks, can be made to your exact specifications and is the ultimate experience in fine drinking. 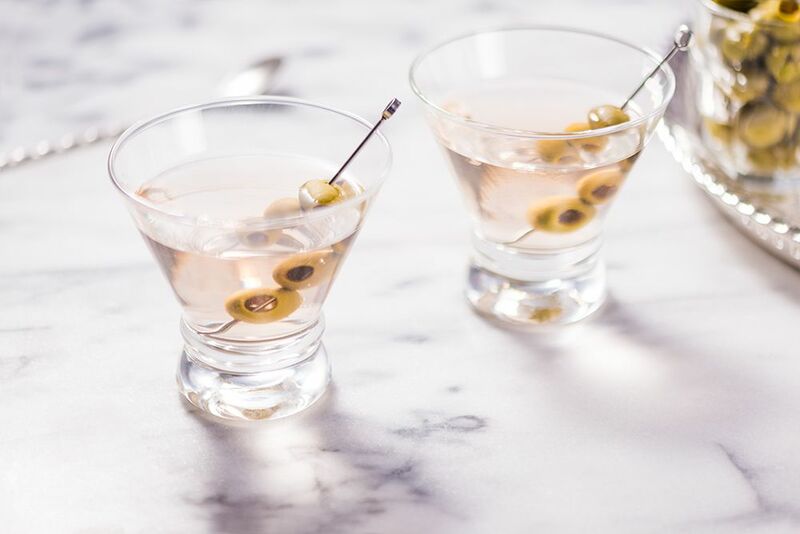 If your martini experience has been limited to the vodka version or the many fruit and cream-filled drinks adorning today's martini menus, then you need to give the original a try at least once. Just ensure that your gin is top shelf. Reliable is the best word to describe the Gin & Tonic. It is another obvious, two-ingredient drink and it is the foundation for many other gin highballs. This is one that is very difficult to screw up and it is always there when you need it, whether that be at the bar or in your own kitchen. The tonic and gin combination is a fantastic one that is on the drier side of soda highballs, which is great if you're tired of all the sugars in today's drinks. While there are certainly average gin and tonics along with some fantastic ones, it’s hard to have a horrible gin and tonic. That said, a great gin and a premium tonic water will bring this simple drink to another level. The other key ingredient: lime. Swipe fresh lime around the rim before giving it a squeeze and dropping it inside. One reader relies on the Gimlet as a summer alternative to the classic martini. It is so true that this simple (again, two-ingredient) drink is a wonder on hot days and if you're curious as to how gin and lime work together, this drink is the best way to test it. This is also one of the few times when you can use an alternative to fresh lime juice. The gimlet can be made with lime and simple syrup, with a homemade lime cordial, or, as has become the custom, Rose's lime juice (which is heavily sweetened). The key is that you need some sort of sweetener to offset the tart lime so it does work with your favorite gin. If you are looking for the ultimate before dinner cocktail, look no further than the Negroni. This popular drink includes gin, sweet vermouth, and Campari, which are each the embodiment of aperitifs and combine for the perfect appetite stimulant. This classic is an acquired taste because Campari is well-known for its bitter aspects, but once you develop the taste for it, you will find that few other drinks work as well when it comes to meals. It is also surprisingly versatile in the cuisines that it can be paired with, though we should admit that Italian food is its best match. The Floradora is a little bit more obscure than the other cocktails in this list and I include it for two reasons: it proves the beauty of gin and raspberry, and everyone who tries it falls in love with it. The second point was proven a few years ago when the recipe went viral after being showcased on a technology webcast. This classic little drink reached an audience that had never heard of it and the reviews came pouring in about how perfect it is in its simplicity. The mix is of gin, lime, raspberry and ginger ale and if you have yet to try it you are missing out on a hidden gem of the cocktail scene. Below are a few more examples of gin and raspberry that are just as fun to explore. Gin and orange juice are another fantastic flavor combination and while the drinks listed below are more well-known, the Monkey Gland is far more interesting. It is, in fact, a personal favorite of all gin cocktails. The Monkey Gland has a funny name, a bizarre inspiration and a little surprise. It all begins rather normally with a mix of gin, orange juice and grenadine. It's fantastic and you could stop right there and have a wonderful drink. It is, however, in need of a little absinthe to make it pop, but you have to keep that flavor in check because it will quickly ruin the effect. What you want is just the underlying hint of anise to give the drink another dimension. It is that little finishing twist that takes the Monkey Gland from good to spectacular. When we talk about iconic gin cocktails, the New Orleans (or Ramos Gin) Fizz must be included in the conversation. It is a complicated cocktail that requires dedication and the results are worth it. The mix is one of gin, citrus, syrup, cream, orange flower water and egg white and it is that last ingredient that is both essential and designates this drink for the dedicated cocktail lover. The egg adds to the creaminess and brings all of the flavors together in a lovely, timeless mix. If a drink were to have a motto, the New Orleans Fizz's would be: Shake It 'Til It Hurts. The Singapore Sling is one of those great cocktails that everyone loves yet no one can seem to agree how it's made. While the original recipe remains unknown and a long list of ingredients have been added and subtracted over the years, we still love the Singapore sling. A few things are commonly accepted about this classic: it includes gin, citrus, cherry brandy and soda; it is served over ice; and it is red. From there, variations have included pineapple, a red wine or sloe gin float, Benedictine, Cointreau, grenadine, etc. My suggestion would be to explore all of the recipes available and find the one that you like best. The Corpse Reviver comes in two accepted recipes: one is a brandy drink and the second uses gin. They are two completely different cocktails and both likely got their names from their ability to wake the dead (or the hungover drunk leaning on the bar a little too early in the day). The find the gin version is more interesting and we include it in an essentials list because it is a wonderfully designed layer of flavors that showcases gin's versatility. This recipe mixes gin with Lillet Blanc, lime, orange liqueur and a dash of absinthe. It very well could be that last ingredient that gave this classic its resurrecting name. The Aviation cocktail was a cocktail that, until recently, was rather hard to make properly. Its key ingredient is creme de violette, which was nearly impossible to find until the contemporary cocktail renaissance that brought many classics like this back into the spotlight. Now that the beautiful purple liqueur is available (Rothman and Winter is one brand) we can once again enjoy this very special drink. The rest of the mix is very simple and requires only gin, maraschino, and fresh lemon. It's a delight and the taste of violet is one to be experienced.